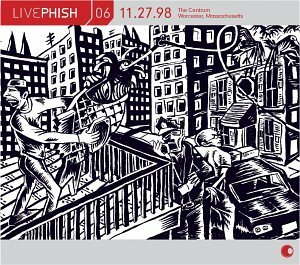 Phish and Elektra are pleased to announce the inauguration of the Live Phish series, which will consist of six complete, multi-CD concert albums to be released every six months. The albums are all mastered from the original two-track soundboard mixes, and will be selected by the band from the full span of their career, including shows not commonly found among traders of the band's concert tapes. The series will feature innovative packaging as well - the CDs will be in metallic paperboard slipcases with unique vinyl inner sleeves that, when removed, can be inserted directly into the custom designed ShowCase 3-ring CD organizer manufactured by Case Logic. This is the ultimate collectors' series for Phish's diehard legion of fans.